Save as much as 38% for domestic calls dialed from your line phone. Convenience in dialing：Enterprise users are required to install speed dialing devices to directly connect to our system. Dialing mode is the same as before. Application services available around Taiwan without restrictions on county/city you are in. Our servicemen are available at your service in all cities and counties. Installation fee：No fees charged from application filing to available for use; no contract signing required. Installation time：Upon receiving application from your esteemed company, we will be sending our servicemen to you for installation services. Work will be completed within one week. Restricted dialing：Depending on your company needs, restrictions are made on international calls and mobile numbers unless otherwise specified(setup). ; Personal dialing inside company can be avoided. Direct hotline dialing： Only enter specific representative numbers to get connected. Dept. Control：Depending on your company needs, company departments may be given a password if necessary; those Dept. without a password are not given access to international, domestic (Mobile) and long-distance calls. Itemised bill：Enterprise/personnel user may inquire itemized bill on-line for instantaneous verification on phone calls made at any time. 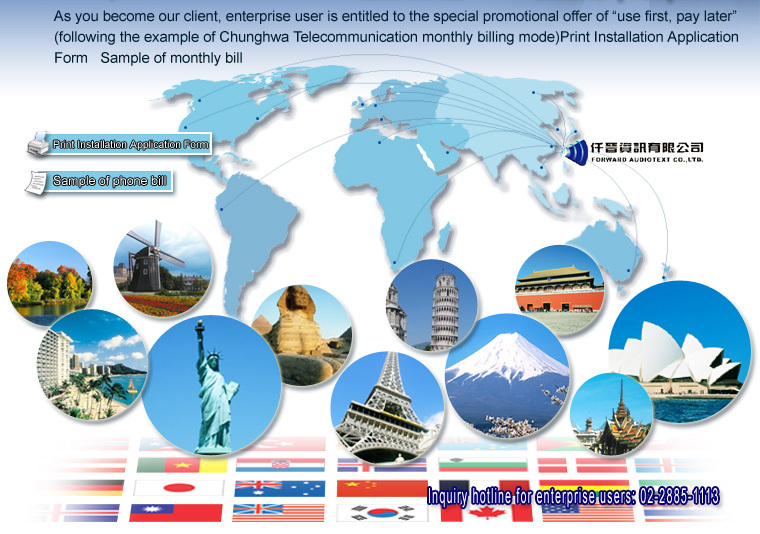 Convenience in making payment：Our company issues a uniform invoice at the end of every month which comes with the phone bill at the beginning of the following month. After receiving the bill, you may pay at 5 major convenience stores, through wire transfer (T/T), post office transfer; siget check, on-line credit card payment, and ATM transfer etc. 2. Attach a duplicate copy of representative I.D. 3.Attach company license and business registration No. or other documents of identity. 2. Attach a duplicate copy of representative I.D., and a duplicate copy of health insurance card.